Tired of games where you find yourself sitting behind a desk falling asleep as your mind turns to mush? Think reading Politico and watching CNN is more entertaining than the mindless garbage being pushed out in the gaming world month after month? Well thankfully a small studio from Belgium has just the answer to your boredom as I found out late yesterday evening sitting down behind closed doors with Larian Studios to get hands-on with Divinity Dragon Commander! So you’re probably wondering what kind of nonsense I’m spouting out about CNN and Politico in relation to a game with gay elves and imps that can barely get their nose over the table to talk to you. Well beyond the cartoony exterior of this title lies real political questions taken straight from politicians from the modern era that will attempt to force the player to react to their personal beliefs while trying to maintain what’s best for ‘The Game.’ By that I of course mean that Larian Studios isn’t just putting you through this to collect datapoints for some study on politics (or are they?). Rather each decision you make will have impact on various factions in the game that may result in events later that decide the fate of your empire. Let’s break this game down into its 3 components to better comprehend this system. Welcome to your home away from battle. Though while bombs might not be exploding and the fate of your empire isn’t at the mercy of your APM, some might find this part of the game far more stressful than running the actual army. That’s because as the game progresses and your reputation from success in battle rises (assuming you don’t go down in flames in your first few weeks as leader), you can garner the interest of the various racial factions wishing to use you as their pawn… er join your mighty crusade in the hopes that their personal ambitions are realized and enacted by your eminence. The factions from left to right include the conservative, though often times unnervingly giddy Undead, the liberal green party Elves, the capitalistic and rather predictable Dwarves, the Libertarian and yet strangely politically savvy Lizards, and the progressive science focused Imps. Between rounds of conquest you’ll be forced to address their randomized issues ranging from gay marriage to breaking and entering principles to political marriages and choose to either agree, disagree, or let the majority of your cabinet decide on the outcome. Players unsure how the respective parties will react or simply shut off from the world outside of video games can also question each council member to get real world opinions on each subject before making their choices. Oh and don’t worry if you ignore them and choose what you feel, they tend to let you know in an animated fashion if you went against their opinion. This is made more impressive by fully voice acted NPCs complete with high quality motion capture models that make you feel like you’re talking to a living being. The princess you choose can also lead to some fantastically wondrous troubles, though that shouldn’t be a surprise for any married or engaged guys out there reading this. Each princess brings their own questlines from an undead princess wanting to be reborn to a sheltered vegetarian elf princess being exposed to meat for the first time against her people’s wishes. Heck you might even end up in a political conspiracy to assassinate the leader of the Dwarves if you aren’t careful. And since you can only choose one princess this should lead to some great replayability as you take on the game in new ways each time you engage in Dragon Commander. Finally you will encounter the bar which is similar to the council, except filled with drunks, racists, and testosterone/estrogen raging generals fresh from battle that are just looking for an excuse to punch you in the face. If all goes well with Dragon Commander’s development, these generals will also represent hero units on the battlefield so here’s hoping that pans out and this plays a much bigger role in the overall gameplay by launch. Once you’ve finished settling down the crew and building mortal enemies, it’s time to play some Risk! The world is a big place and anyone thinking to conquer it is in for a long campaign filled with tragic setbacks and backstabbing politicians. Thankfully this has been simplified in Dragon Commander to a map not unlike the Risk boardgame in which each country and various cut outs of ocean are presented as tiles on the playing field. Here commanders spend their gold in a way that would make a Dwarf cringe as they construct buildings and units, purchase playing cards, and research upgrades to gain an advantage on the battlefield. As you capture and hold various nations you gain income and population (to be explained in the third segment). This creates a never-ending political gambit of spending money to capture territory to earn more gold to afford units to defend more territory in a game we call the United States government. However just as you’re attempting to expand your influence, various forces will seek to put your uprising down and rush the tale of the Dragon Commander off the map and into the history books. After you’ve made all your purchases, moved your pieces, and played any territory cards, it’s time to hit enter and pray you’ve out strategized your foes. Their pieces will then move and you will have the option to let events play out automatically or enter battle as your glorious dragon self to make sure events end in your favor. 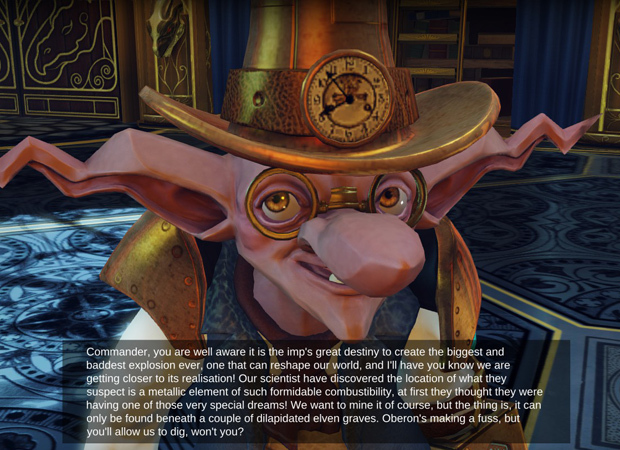 This part of the game left an impression on me and turned the faces of the various members of Larian Studios red. Or was that just too much wine and setting up the day’s demo at 5am in the morning? Either way it was the most intensive 2v2 battlefield experience I’ve had in an RTS ever. Starcraft and Supreme Commander sure offer tons of strategic value, but it just takes on an entirely new level when you know you’re about to lose a building that will cost you the game, and you can swoop down as a dragon and personally block the assault to stretch the match out a little longer. Now the kicker to this mode is the battle is not meant to be even. Don’t think you’re all starting with a base and plan to spend the next 10 minutes building collectors and acquiring crystals. Instead each side involved starts with units based on the Risk level map’s piece movement and that’s what you have to work with to win the game. The map selection is randomized so you have to pick up and go with whichever map you end up on and whichever starting point you get and start capturing buildings. Some building points allow you to build community centers to start gaining bonus population (as I mentioned earlier, it’s used as a currency for purchases on the RTS map). Some small buildings exist to build turrets. Larger building points let you build barracks, factories, seaports, and airports for constructing additional units beyond the ones you brought to the battlezone. Although much balance and AI tweaking is needed prior to launch, we did experience an epic match where both sides’ resources were completely drained to the point that it became a 2 on 2 dragon royal in which the best FPS player would win. Yet even here tactics matter as not every dragon is built equally with some sacrifice the strength of their units to bolster their personal power. So players that go support with their dragon had better try to use their advantage while they can or face an uphill battle against a statically more powerful dragon commander in the end. I have to say just when I thought I had seen it all, this game comes out of nowhere and blindsided me with a mode so original and so well done that I just wanted to throw my money at them on the spot. So what happens when the dust settles and the mighty Dragon Commander settles back on the Raven? Assuming your capital is still standing, the entire process repeats. The Rivellon Times newspaper reports on the events of the round and the level of support you are garnering from the various racial factions while rewarding gold, influence, and if you’re lucky, powerful cards to use in future battles. Then you’re off to the council to see how the game has progressed. The game brings so much to the table for so many types of players. I’m glad to live at a time where titles have returned to their roots where story matters yet with modern technology where FPS RTS hybrids can be so well executed. And the best news of the day was we would be seeing this title launched prior to PAX Prime so my dragon commanding days need only wait a few months longer before I can turn to the skies.